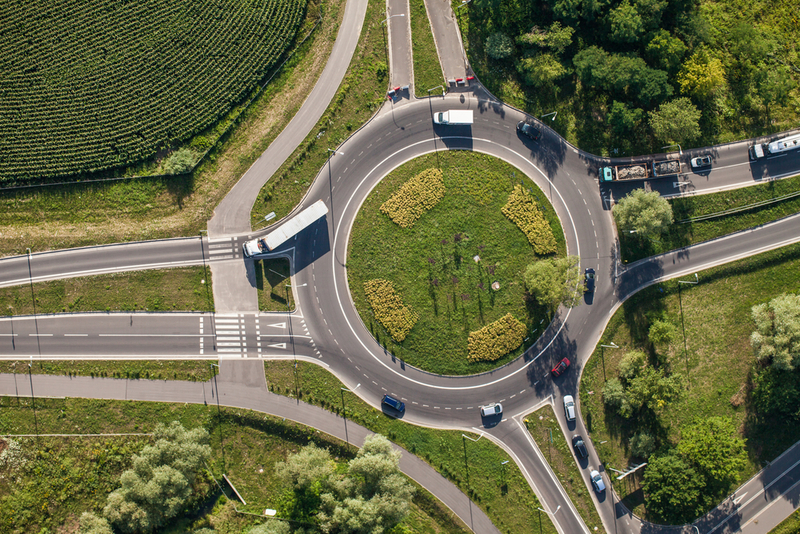 Roundabouts are becoming more and more common on American roads, but sometimes even the most seasoned driver can get confused when faced with one of these enigmatic traffic circles. Who gives way to whom? Which direction do you signal? How on earth do you navigate roundabouts with multiple lanes? To help you answer these questions and more, we have put together a handy guide for the correct protocol when driving on a roundabout. One of the advantages of a roundabout is that it does not stop traffic like a stop sign or a red light would. If a roundabout is empty, you do not have to stop before entering. However, that does mean that you must exercise extra caution on approach, and make sure that it is completely safe before entering. Slow down when you are approaching a roundabout, and if the way is clear, then you can proceed. The first and most important rule of a roundabout, is that you give way to vehicles that are already occupying it. Just as you would when entering a regular road, you must wait until there is sufficient space to enter the roundabout. When two or more vehicles approach a roundabout at the same time, you must then give way to the vehicle to the left. Otherwise it is first come, first served. –When turning right (first exit), signal right as with a normal right turn. –When going straight ahead, no signal upon entering, signal as you approach your exit. –When turning left (last exit/three-quarters around), signal left upon entering, switch to right as you come to the exit. –If you are turning right (first exit), take the outside lane. –If you are taking a further exit, take the innermost lane and move over prior to your exit, after the first or second exit.